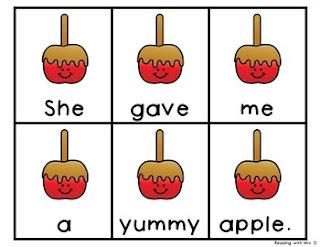 Are you looking for a way to help your students with sentence structure? Scrambled Sentences are a great hands-on method! Autumn is around the corner, and what better writing activity to add to your classroom than themed centres? Here is my new Autumn scrambled sentences game for your early childhood classroom. Simply print, cut and laminate each card and have students order the sentences. If desired it should be easy to code the back of the cards for self-checking! 3 recording worksheets for students to record their constructed sentences. 1 Additional worksheet so teachers may choose which four sentences to form. Please check out the HALLOWEEN preview above! Before you pass on this product, if it's not quite what you're looking for, this is your chance to make a Custom Request! PLEASE Leave me a Q&A above. You can receive FREE credit towards ANY purchase on TPT just by leaving Positive feedback! Just click on My Purchases to leave star ratings on past purchases! Or leave it below Now. It’s that easy! • To know when new products are added to my store, please click the GREEN STAR above. • Visit and Follow Reading With Mrs. D on Facebook. • Follow the Reading With Mrs. D blog.